A race car that runs on a 98 percent blend of ethanol was recently featured on the PBS TV show Farm Connections. The US Ethanol Race Car is sponsored by Hydro Dynamics, Inc. of Rome, Georgia, the developer of a patented cavitation process intensification technology called the ShockWave Power Reactor (SPR), enabling customers to solve critical mixing and heating problems. 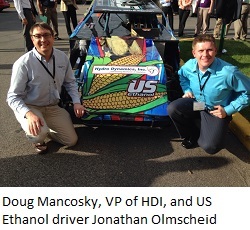 Beginning this year HDI sponsored the US Ethanol car by Olmscheid Racing. 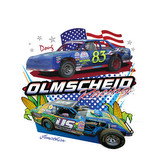 Olmscheid Racing, based in Elrosa, MN, competes in the Midwest. The HDI logo is prominently displayed on the hood and provides excellent brand awareness in the heart of the ethanol industry of the Shock Wave Power Reactor (SPR) cavitation technology. The SPR has several ethanol applications including yield enhancement, increased production of corn oil, cellulosic ethanol and the conversion of extracted corn oil to biodiesel. HDI’s extensive renewable energy portfolio also includes biogas, conventional biodiesel and algae oil extraction. The sponsorship has been a great way to draw attention to our ethanol initiatives including our new bolt-on biodiesel plants to convert corn oil to biodiesel. More information about the process is available at www.hydrodynamics.com. KRA Speedway opener is set for May 1st. KRA is located in Willmar, MN. Check out their full schedule here. RACING in 2014: The MN Corn Grower organization has made a few changes to the racing program for 2014. They will be targeting the metro area where fans are less familiar with ethanol. 70% of our Fuel sales of ethanol are occurring in the padd II division of MN between Minneapolis/St. Paul Metro and the Rochester Metro markets. The dates for the races are June 7th in Elko, MN and July 19th in Spring Valley, MN. Olmscheid Racing will be attending both events. The 2014 racing season is coming soon. Looking at May to start in Willmar, MN. Olmscheid Racing is supporting US Ethanol again this year. Jonathan has started preparations on getting his car ready. Doug has started getting a new car ready after taking a rolling tumble down the back stretch at the end of the season last year. Stay tuned for race schedules and Jam the Stands events. It was a great year for the Olmscheid Racing team. We want to thank our fans for your support! We also want to thank all of our sponsors! Be sure to join us again next year as plans are already underway for the 2014 Season! Under photos ~ Clink the link that shows after you hover. Results are in from KRA Speedway in Willmar for Friday, September 6, 2013. It was the first night of the KRA Speedway Fall Festival. Jonathan finished 4th in his heat and 7th in his feature. Doug finished 8th in his feature and a DNF in the feature with a wild ride with an end-over flip down the back stretch. He fired the engine and wanted to keep racing but had no steering. Most likely a season ending night. Jonathan is planning on racing the Saturday night at Granite Speedway, Gold Cup Tripleheader, September 27, 28 ant 29. Don’t forget to order your t-shirt to wear and show your support by calling Jonathan at 30-250-0256 or email at jolmscheid@hotmail.com!! Check out this video by clicking here first!! Then click here to watch “Jam the Stands” in action! Thank you MN Corn Growers and US Ethanol! Order your t-shirt today by calling Jonathan at 320-250-0256 or email him at jolmscheid@hotmail.com!! Click on Olmscheid Racing T-Shirts to see photos!! Results from KRA Speedway are in for August 22, 2013. Jonathan finished 6th in his heat and a DNF in the feature. Doug finished 6th in his heat and a DNF in the feature.